Identity design, visual style and web site design. Food Republic is Chef Marcus Samuelsson's food culture site targeted to men. 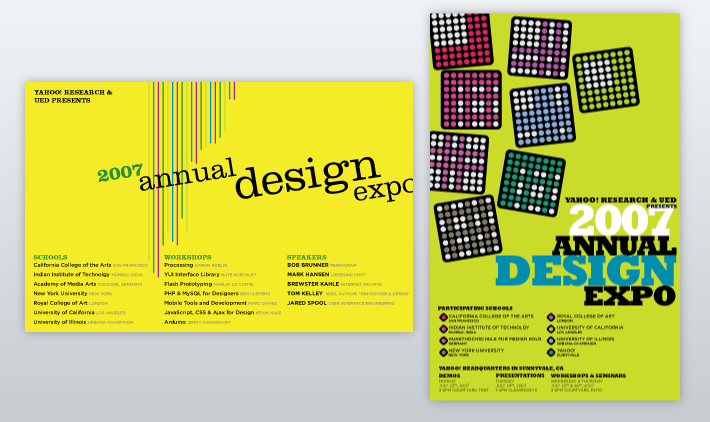 Identity design including logo design, color palette, and typography. Brooklyn Winery is an urban winery and winemaking center located in Williamsburg, Brooklyn. Design of two tshirts: one public-facing (left) and one internal design for the Flickr team (right). Mobile phone wallpaper backgrounds for a major brand's yet-to-be-released smartphone. Online application for management of video content. Yahoo! Groups, a well-established online email community service with over 90 million subscribers, was in need of an updated look and feel. I led the visual exploration phase, which included a comprehensive competitive analysis, moodboards exploring site personality, and user research which led to a fresh new visual style that not only resulted in an overall cleaner user interface, but better monetization through increased traffic to the site. Yahoo! 's Annual Design Expo hosts lectures from some of the industry's most prominent speakers, and includes design projects created by renowned university design programs. I created these posters to reflect the nature of the event: bold, original, and free-spirited with an eye towards sharing knowledge in and outside the design community. Yahoo! partnered with Naomi Campbell and Ralph Lauren to host a real-world fashion show and online charity auction benefiting victims of Hurricane Katrina. I created the site design to communicate the sincerity of the cause as well as the enthusiasm of a fashion show. The site resulted in thousands of dollars donatedto the Hurricane Katrina victims, as well as coverage in USA Today, AP, People, and US Weekly. As one of the first personalized pages on the Internet, My Yahoo! had amassed a following of over 250 million users. 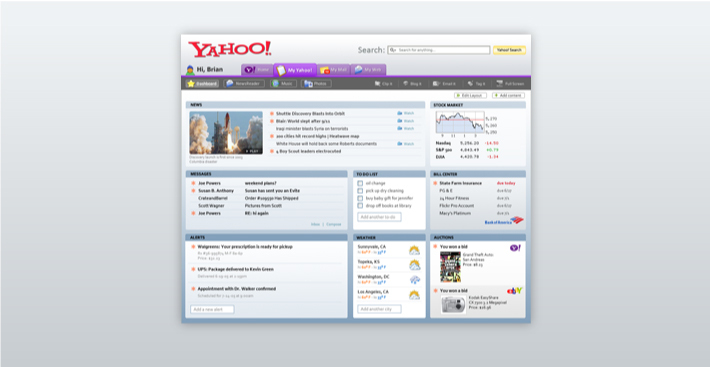 The redesign aimed to update the entire user experience from start to finish. I led the team as Design Manager during the strategic exploratory phase, and then led the visual design during the ideation phase. The redesign vastly improved the ease of use of the site and added a more sophisticated and modern look and feel. © Copyright 2010 Kathleen Watkins.